A graphical representation of MeyGen’s tidal energy project. Atlantis Resources’ AR1000 single-rotor tidal turbines are planned to be installed at the site. Image courtesy of Atlantis Resources Limited. The Pentland Firth tidal power project is located in approximately a 3.5km² offshore area of the Inner Sound of the Pentland Firth. Six turbines will be installed in the demonstration phase. Image courtesy of HaskoningDHV UK Ltd. The Pentland Firth tidal power plant, under construction, will be the biggest tidal turbine array in Europe. Proposed by Atlantis Resources’ subsidiary MeyGen, the project is located in the Inner Sound of the Pentland Firth, between mainland Scotland and Orkney. The onshoreconstruction works of the project began in January 2015 and the first turbinewas officially unveiled in September 2016. Full-scale production is expected to start by 2020. MeyGen secured consent to build the first phase of the tidal power project from the Scottish government in September 2013. Atlantis Resources, however, fully acquired MeyGen in November 2013 from GDF SUEZ and Morgan Stanley. The Pentland Firth tidal power plant is planned to be developed in two phases. A demonstration phase (Phase 1A) comprises four 1.5MW turbines. Andritz Hydro Hammerfest (AHH) supplied three turbines and Atlantis supplied the fourth turbine. 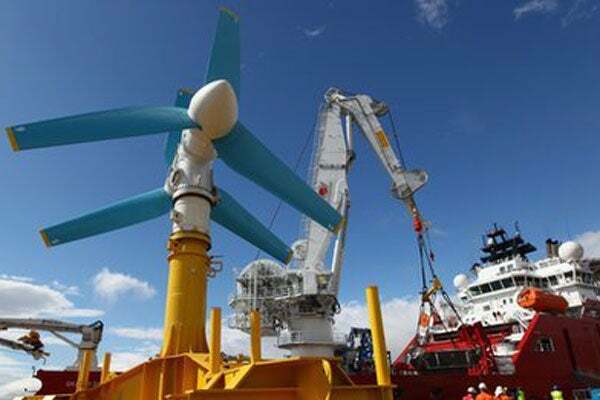 Each turbine is installed on the seabed with a gravity-base turbine support structure and a 4.4kV turbine subsea cable. The environmental impact assessment (EIA) for the first phase was completed by Xodus under a contract awarded by MeyGen. The first phase of the project will be an 86MW turbine installation,which is targeted to be completed by end of 2016. The second phase, which will increase the capacity to 398MW, will require separate approval by the government. Each turbine will have its own export shore to shore. The buried cables will be brought to shore through horizontal directional drilled (HDD) bores dug in the bedrock and connected to the power conversion centre (PCC). The marine power generated will be exported onshore for transmission to the National Grid to be distributed to approximately42,000 homes in Scotland. The PCC will include a control building, three power conversion unit buildings (PCUBs) measuring 45m-long, 30m-wide and 13m-high, and feature power conversion equipment, switchgear and transformers. "The PCC will include a control building, three power conversion unit buildings (PCUBs) – 45m-long, 30m-wide and 13m-high, each having power conversion equipment, switchgear and transformers." T.he Pentland Firth tidal power plant will be connected to a 15MW local distribution grid network managed by Scottish Hydro Electric Power Distribution (SHEPD). "The project will also be connected with high-voltage transmission network managed by Scottish Hydro Electric Transmission (SHETL)." Pentland Firth has significant marine power as its tidal currents are considered to be the fastest in British Isles. Researchers from Edinburgh and Oxford Universities estimated that turbines in the Inner Sound stretch of water could generate 1.9GW of clean and renewable energy for Scotland. The research, commissioned and funded by Energy Technologies Institute’s Performance Assessment of Wave and Tidal Array Systems project (PerAWAT), also underscored the ways to develop and regulate the marine resource effectively. A 25-year old operational lease agreement signed with UK Crown Estate in October 2010 gives MeyGen exclusive rights for development works at Inner Sound. The company has also taken care to minimise the impact of the power plant on sealife and shipping trade. The turbines will be located across the stretch of the channel, in an area with 3.3km² of high currents between Aquamarine Power and Pelamis Wave Power, in order to tap the full potential. The European Commission granted €7.7m to facilitate the design, construction and installation of the tidal turbines. Royal HaskoningDHV was one of the consortium partners that helped secure the funding. Pentland Firth Tidal secured £51.3m from a consortium comprising the UK Government, Department of Energy and Climate Change (DECC), Scottish Enterprise, Highlands and Islands Enterprise (HIE), The Crown Estate (TCE) and Atlantis Resources. The Scottish Government provided £23m in funding for the first phase of the Firth Tidal power plant in September 2016. James Fisher is responsible for offshore installation of the tidal turbines and related infrastructure. ABB secured a contract to supply the electrical equipment for onshore construction of the project. The contractual scope includes designing, engineering, supply and commissioning of the power conversion, switchgear and transformer solution, as well as associated civil engineering and cabling works. John Gunn & Son was subcontracted by ABB for performing civil works. O’Connor Utilitiesreceived a contract to design and drill four horizontal directionally drilled (HDD) bores. IMMI Turbines is a specialist in the acquisition, refurbishment, and overhaul of turbines for power applications. Services include maintenance, major inspections, and gas turbine repairs worldwide. Founded in 1930, TKF has developed from a local Dutch cable producer to a cable technology leader servicing customers all over the world. As a member of TKH Group, a Netherlands-based international group of technology-powered companies, TKF has access to various international marketing, purchasing, sales and research groups with diverse specialisms.